Pleasingly I have completed all three tasks. Whoop, whoop! Pat on the back for me. I thank you very much. Now, I’m not just writing this blog post to show off (well maybe just a tiny bit) I am actually writing this because it is the first time in my life that I have had the time and head space to get creative. I love baking and I love sewing but I have never motivated myself to find the time to start (or rather finish) handmade projects. Now that I am an Expat Wife and a Single Wife with plenty of alone time I have found the motivation to do so and have encountered some inspirational people in the process. I enjoy baking, more than I like cooking. Cooking is just an essential, routine, boring part of the day where I have to provide my family with nutritional meals. Baking is where you get to indulge, to create a bonus, a little slice of heaven to serve with that ordinary cup of tea. I am not a superstar baker but my cakes and biscuits rarely get left in the tin to go mouldy. I find baking therapeutic; the measuring, beating, folding. Combining a host of innocuous ingredients to create something, well, delicious. The smell of a baking cake that wafts around our open plan living space provides comfort and creates a little cocoon against all the strangeness that we find ourselves in. My Mum has always had cake in the tin, the occasions are few and far between when a sponge or fruit cake hasn’t been available to accompany our cup of tea and gossip when visiting. As I have grown into the roles of housewife and mother I have started to follow suit and I feel embarrassed if I am unable to offer a morsel of something homemade to any guest that drops by. Since we have been in Switzerland I have been unable to source self-raising flour and so have been using baking powder and plain flour with varying degrees of success. 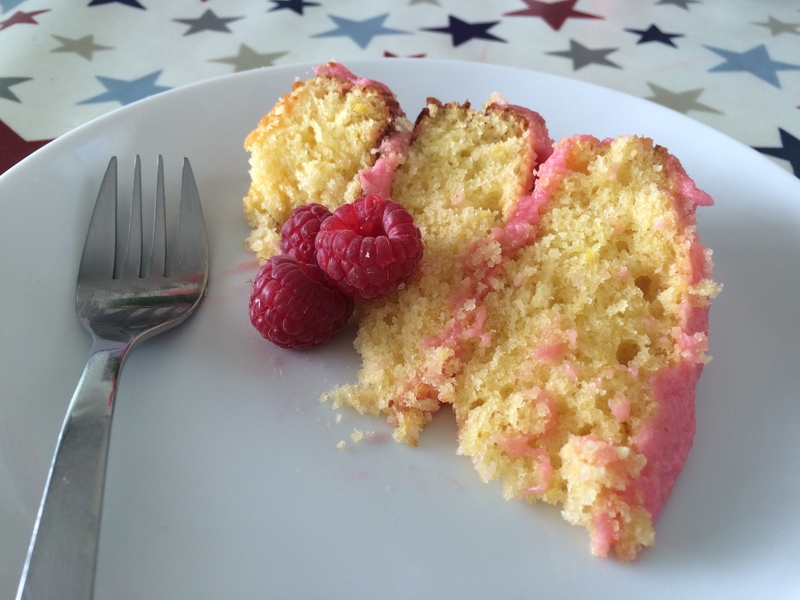 The lemon and raspberry cake of Mr Burr’s uses this very combination of plain flour with baking powder so I was a little apprehensive of the outcome. However, I have to say that the lemon sponges I made this week have quite possibly been the best I have made to date. This cake provides a treat for all the senses. It starts with the sharp, sweet lemon scent, that prompts a reflex from the saliva glands as soon as the tin lid comes off. Then your eyes lower and feast on the pale yellow, light, fluffy, inviting, sponge contrasting with the pale pink raspberry icing. You grab a knife to slice through the three soft layers and experience no resistance as they give way to create a slice of beautiful art that you carry aloft to your waiting plate, the smell of lemon once again tantalising you with it’s freshness. Then, finally, you reward your taste buds with that first mouthful, the sweetness balancing perfectly with the zesty lemon that must surely be the epitome of paradise. Homemade indulgence. Homemade perfection. Thank you Mr Burr for bringing this plate of gorgeousness into my day and reminding me that homemade pleasures are definitely the best. The other two of my three tasks can be read about in Handmade Tale – Sewing .